The Swiss Confederation is a landlocked nation state in Central Europe. Countries bordering Switzerland are France to the west, Germany to the north, Austria and Liechtenstein to the east and Italy to the south. Bern is the capital city and the seat of the Federal Government and situated on the Swiss plains. Zurich, Basel and Geneva are the main centres of business and industry. Luzern, Lugano and Lausanne are other important centres of culture and tourism. The country is split into 26 Cantons, or small states each of which have their own constitution and elected regional assembly, similar to the United States of America. Much of Switzerland is mountainous, with the Alps covering about two thirds of the southern part of the country. The highest peak in Switzerland is Monte Rosa on the Italian border at 4,600m or 15,000 ft. Other spectacular mountains include the Eiger, the Jungfrau and the Matterhorn. The north-west border with France has the Jura Mountains which slope up to the Alps through the Swiss Mittelland plateau. Switzerland is well known for its lakes including Lake Geneva on the western frontier with France, Lake Luzern in central Switzerland, Lake Lugano on the southern frontier with Italy and Lake Constance on the western frontier with Germany and Austria. 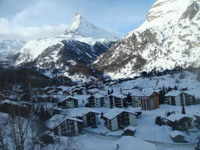 Switzerland’s enjoys a continental climate, heavily influenced by the mountainous terrain varying according to altitude. The valleys and plains have hot summers and cold winters with the mountains colder throughout the year. Temperatures in the Ticino region in the south tend to be warmer, as does the western part of Lake Geneva. The Alpine geography creates a series of regional microclimates, the Italian Canton of Ticino having an almost Mediterranean climate, to permanent glaciers and snow fields in the high Alps. The flora and fauna of Switzerland are heavily influenced by the mountainous landscape with deep valleys, lakes and rivers. This remote landscape has contributed to preserving many rare species of plants, birds and animals which have been driven out of areas colonised by humans. Coniferous trees are very common as they are hardy enough to survive the harsh cold winters and higher in the Alps there are Alpine pastures and scrub bushes. The hot summers support many rare flowers in the high Alpine pastures, including Eidelweiss. Palm trees can be found in the Canton of Ticino! Wolves and lynxes are still found living in the wild. Foxes are increasing in cities and towns. Deer, ibex and chamois, both mountain goats also live wild, mainly in the high Alpine valleys and pastures. Many types of freshwater fish are found in the lakes and rivers, including dace, trout, perch, char, pike and freshwater salmon. Birdlife includes swans, ducks, coots, seagulls (which live by the many lakes), sparrows, thrushes and pigeons. The Alpine valleys and mountains support birds of prey like eagles and recently the Bearded Vulture has been reintroduced to the Alps. Despite the reintroduction of birds like the vulture, birdlife is still being harmed by human activities and over 80 species are threatened with extinction. Scorpions are found in Switzerland, together with many species of amphibians, including toads, and reptiles, as well as snakes and salamanders. The heavy industrialisation of parts of Switzerland, particularly the chemical and manufacturing industries, has left a continuing legacy of environmental damage and pollution. Acid rain has affected Alpine forests and chemical spills into rivers and lakes, notably mercury into the Rhine, have affected fish and other ecosystems like marshland. The increase in wolf and lynx populations have led to conflicts with humans and a programme is underway to educate the Swiss people about predators. Switzerland has one of the oldest National Parks in Europe. This is in the eastern part of Switzerland in the Canton of Graubunden. Environmental matters are taken very seriously in Switzerland and legislation, driven by the population, has resulted in considerable change for the better in recent years. The Swiss Agency for the Environment, Forests and Landscape (BUWAL) is responsible for managing Switzerland’s natural environment. There are few remains of pre-Roman civilizations to be found in Switzerland. Some finds have been made of Bronze and Iron Age tombs which provide an insight into how the prehistoric settlers of Switzerland lived. Evidence of Helvetian settlements near to rivers have been found. The defeat and integration of the Helvetic tribe by the Romans in the first century BC gave rise to the first well preserved settlements. In Basel there are remains of the Roman colony of Augusta Raurica, which was founded in 1st century BC. These include ruins and monuments, with a traditional Roman Forum and theater. Particularly striking throughout the country are the hundreds of castles, including the Castle of Chillon and Gruyeres Castle, most built in a classic medieval style. Many of the towns and cities have “old towns” dating back to the middle ages, Fribourg has a particularly well preserved medieval old town, with churches and a castle. A feature of some Swiss cities are the covered bridges over rivers running through them. Luzern has two bridges, although one, the Chapel Bridge, was destroyed by fire in 1993 and has been completely rebuilt. Switzerland’s relative stability during much of its history, and particularly this century, has meant that fine examples of architecture from many periods have been preserved. By far the greatest impact Switzerland has had on the world of architecture, both at home and internationally, is through the life and works of Edouard Jeanneret Gris, known as Le Corbusier. Zurich has a museum devoted to his work in developing the basic principles of the Modernist style of architectural design. 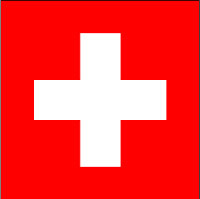 The population of Switzerland was estimated at 7,581,520 in 2008. With much of the land area mountainous and one fifth of the country covered by lakes, glaciers, rocks and permanent snow, Switzerland is densely populated. Switzerland’s history and position in Central Europe has led to three major distinct national identities evolving: German, French and Italian. A very small percentage of the population, are Romansch and are mainly in the eastern mountains of Grisons, in the Canton Graubunden. In the 19th century Switzerland was the poorest country in continental Europe which inspired a tradition of emigration, still part of the culture today. The number of Swiss citizens resident in Switzerland has decreased since 1996. Asylum seekers and refugees have traditionally been welcomed in Switzerland since the 1957 Hungarian revolution. Immigrant groups include Hungarians, Tibetans, Tamils and Kosovars. Switzerland accepted the second highest numbers of Kosovan asylum seekers after Germany in 1998. There are three official languages in Switzerland reflecting the three main national identities: German, French and Italian. In practice, many documents also appear in English, which is widely spoken throughout. Most Swiss speak at least two, if not three, languages with one generally being English. Raeto-Romansch is spoken by a very small part of the population in the eastern mountains. Spoken Swiss German, Schwyzertüütsch or Schweizerdeutsch, is very different from the “High” German spoken in Germany, or Hoch Deutsch. There are concerns that the dialects of Schwyzertüütsch spoken in different German speaking Cantons are becoming more distant from the “official” Hoch Deutsch. The Swiss population is mainly split between the Roman Catholic and Protestant faiths. The most common of the Protestant faith is Calvinism and Switzerland had an important role in the Reformation of the 16th Century. John Calvin and Ulrich Zwingli, a Zurich priest, both spoke out against the Roman Catholic Church from Switzerland. The other main world faiths are not that well represented in Switzerland but include Islam (Muslim faith), Judaism (Jewish faith) and faiths such as Hinduism and Buddhism are found mainly within the immigrant communities. Switzerland is commonly associated with chocolate and cheese Fondues, but has a rich and varied culinary tradition in part drawing from French, German and Italian cultures with some uniquely Swiss additions. Traditional Swiss Fondues are a blend of Emmental and Gruyere cheeses, nutmeg, garlic, cornflour and Kirsch (Swiss Schnapps) all melted in a ceramic Fondue Pot into which diners dip small cubes of bread, and served with pickled gherkins and onions. The origins of the Fondue are thought to be from the high valleys where, cut off during the long winter months, the foods which kept the longest were stale bread, cheese and pickles. Fondues in different regions of Switzerland can be found using the local cheeses, and meat Fondues are a popular modern dish where chunks of meat (instead of bread) are dipped into hot oil (instead of cheese) and “deep fried”, then dipped in various sauces. With all the lakes and rivers of Switzerland, there are many traditional freshwater fish dishes, including dace, trout, perch, char, pike and freshwater salmon. Cakes, pastries, tarts, gateaux and chocolate are common deserts or snacks. Breakfast is often muesli, and Birchermuesli, which uses yoghurt instead of milk or a selection of meats, cheeses and bread or pastries like croissants. Many meat and sausage dishes are accompanied by Rösti, a dish of grated potato fried into a pancake. Tea, coffee and hot chocolate are the most common beverages, although tea tends to be drunk with a slice of lemon rather than milk. Lager beers such as Hurliman are drunk more in the German Cantons, with wine being drunk in the Italian and French Cantons. Switzerland produces many fine wines, mainly in the French Cantons of Valais on the south facing hills of Lake Geneva, Neuchatel and Sion, which are rarely found outside of the country. Kirsch, Pflumli and Grappa, all fiery spirits similar to Schnapps are drunk after meals and used in Fondues.